There may have been protests last Friday in London and around the UK, but US President Donald Trump also has his admirers, as has been proven at hairdressing salons up and down the country, with haircuttists saying that the 'Trump combover' is the style that the vast majority of fashion-conscious Brits are asking for! Trump, 72, visited the UK last week to meet the Queen and Prime Minister Theresa May before going on to complete the most important part of his trip in Scotland, where he played golf. A 20-foot balloon of a baby in a diaper in the image of Trump, was flown in the London sky to show the President what a section of the populace thought of him, but others were quick to give him their support. Many say that the UK, itself, would benefit from having a leader like Mr Trump, but it's possible these people, as well as not knowing anything at all about politics, do not know the meaning of the word 'megalomaniac', or, indeed, which day of the week it is. 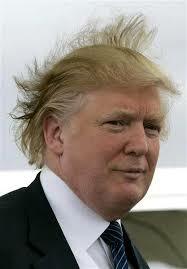 The main effect the President has had on his UK fans is with regard to his hairstyle. Queues formed early on Saturday at hundreds of hairdressing salons all over the country, with a whopping percentage of customers asking for "a Donald Trump". "He's a very distinctive man, and it's a very distinctive style. We're a business, and happy to oblige."